A baggage handler stands on the edge of a runway as a landing plane approaches. 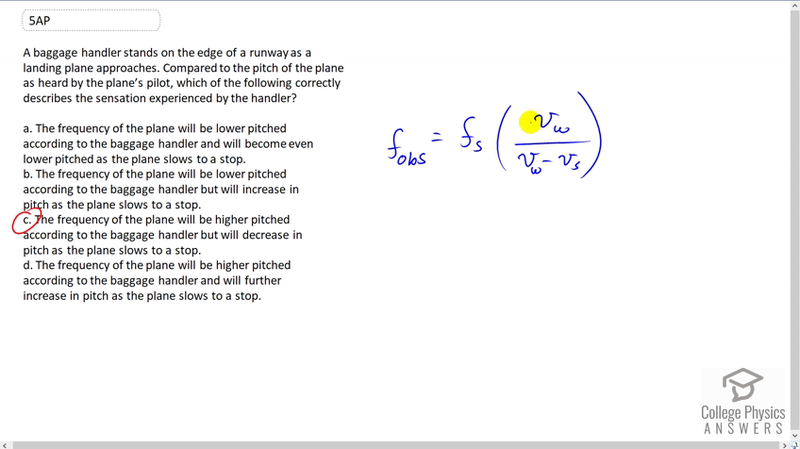 Compared to the pitch of the plane as heard by the plane’s pilot, which of the following correctly describes the sensation experienced by the handler? The frequency of the plane will be lower pitched according to the baggage handler and will become even lower pitched as the plane slows to a stop. The frequency of the plane will be lower pitched according to the baggage handler but will increase in pitch as the plane slows to a stop. The frequency of the plane will be higher pitched according to the baggage handler but will decrease in pitch as the plane slows to a stop. The frequency of the plane will be higher pitched according to the baggage handler and will further increase in pitch as the plane slows to a stop. This is College Physics Answers with Shaun Dychko. The Doppler shifted frequency due to a moving source is given by this formula, where it’s the source frequency times the speed of sound divided by the speed of sound minus the speed of the source, when the source is moving towards the observer as it is initially in here. So as the airplane approach the baggage handler, the frequency of the baggage handler will perceive is going to be higher because we’ll have a minus here and that’s going to make this denominator smaller than Vw and so that’s going to make this fraction greater than one and so the observe frequency is going to be greater than the source frequency. And then after the plane comes to a stop, well as the plane slows down, this effect gets less and less and this denominator approaches Vw in which point when Vs is zero, this is just the number one and the observed frequency will be the same as the source frequency. So the answer is c.